Daniel Kahneman once said, “Hindsight makes surprises vanish.” The hindsight bias can lead investors to constantly fight the last war. Since the financial crisis the last war has made top calling in the markets a cottage industry. Looking back now the peak before the prior crash looks easy. It was not. Predicting when the music will stop is not easy. This piece I wrote for Bloomberg shows why. There’s a simple reason the future always feels uncertain but the past seems relatively orderly: No one has any idea what the future holds, while hindsight allows us to assume that the past was more predictable that it actually was. Take the Great Financial Crisis. The majority of investors, economists, policy makers and regulators were completely blindsided by the worst economic and stock-market downturn since the Great Depression. Yet when these same people look back at that fateful 2007-2009 period, it seems many of them now believe that they knew it was coming and called it in advance. It can be very lucrative to be right about major market events. Many who actually did see the crisis coming became household names in the finance industry and parlayed that success into book deals, keynote speeches, television appearances and “thought leader” status. Since so many people were cheerleading right up until the market crash, no one wants to get caught flat-footed again, leading to a steady increase in the number of people now calling for a market top. What jumps out is that there’s no discernible pattern among previous peaks. The stock market has experienced bear markets with high valuations and low valuations, high bond yields and low bond yields, high dividend yields and low dividend yields, high inflation and low inflation. Stocks were a bargain based on many valuation metrics in the late 1940s, mid-1970s and early 1980s, but that didn’t stop the market from falling around 20 percent in each instance. Stocks were expensive in the fall of 2007, but they didn’t reach the nosebleed valuation levels of the late-1990s tech bubble. The stock market has three main drivers of performance — trend, sentiment and fundamentals. The first two factors dominate the last one right up until investors decide it’s time to start paying attention to fundamentals again. Sentiment tends to follow price, so at a certain point, the trend in the market is the only thing that matters. And when that happens the market turns into a confidence game. There’s no formula for forecasting market tops because you’re really trying to predict human behavior, which can’t be done. Trees don’t grow to the sky, but that doesn’t make it any easier for investors to guess when the inevitable mean reversion trade will kick in. Fundamentals matter over the very long term, but in the short-to-intermediate-term, the stock market is a confidence game. The market will top out and experience a bear market when investors lose their nerve for some reason. Historically, that reason typically has to do with a recession. The table above lists 15 bear markets. Eleven of those were preceded or followed by a recession in very short order. 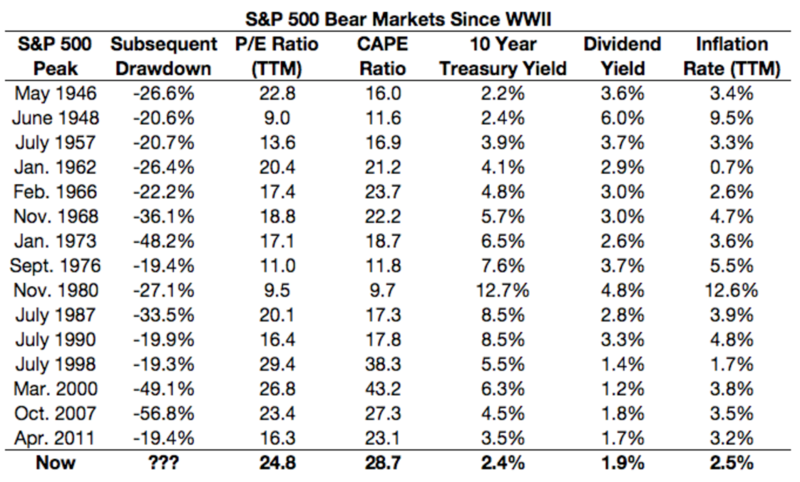 The only years when bear markets weren’t caused by a recession were 1966, 1987, 1998 and 2011. So there’s a good chance the next market peak will be caused by a downturn in the U.S. economy. Unfortunately, predicting a recession is just about as difficult as picking a market peak. The next time the market tops out it will seem so easy to have predicted it after the fact. Getting there ahead of time is the tricky part that no one has quite figured out yet with any precision.